(1) Where do I begin? (2) How can a single treatment method address such a variety of issues? The discovery statement of EFT states that “the cause of all negative emotion is an imbalance in the energy system.” All reactions, feelings, responses or physical symptoms can be addressed by balancing the energy system with EFT. (3) Are there any contraindications to using EFT? The research so far has indicated there are no contraindications to using EFT. To date, minimal side effects have been reported other than occasional temporary fatigue. However, this does not mean that you will not experience adverse side effects. Consult a professional EFT practitioner for professional application of these techniques. (4) Is there anything that prevents EFT from working? Occasionally, the targeted issue is approached too globally which results in ineffective relief. In rare cases, energy toxins such as perfumes or certain foods produce an allergic reaction in an individual’s energy system and retard, or temporarily reverse treatment. Skilled EFT practitioners will spot this block and be able to treat the client effectively. 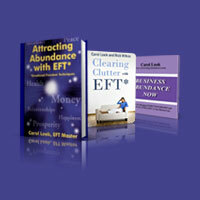 While not perfect, EFT has an extraordinarily high success rate of 85%. Usually, when EFT appears to have no effect, it has been found that additional aspects of the problem need to be addressed with EFT first. (5) Can I treat myself? (6) Suppose my illness has lasted decades or is an inherited condition? Using EFT and variations of Meridian Tapping have been able to alleviate symptoms regardless of duration, etiology, or family history. (7) How long will the treatment last? It is difficult to predict this outcome, however, indications are that long-lasting results are routine when using EFT/ Meridian Tapping appropriately. If you or the practitioner successfully treats the core of the problem, it has been shown to provide permanent relief. (8) How long will it take to be successful with me? Some symptoms, like certain phobias or issues connected to single events, have been shown to clear in one round of EFT (“one minute miracles”), however, complex issues can consist of several smaller inter-related problems that must first be treated before healing can occur. Be persistent and patient. EFT practitioners should be consulted for complicated issues and your physician should be a part of any treatment that involves medical related issues. (9) Can EFT be used for children? Yes, usually with superb results. The language needs to be tailored to the child’s age. (10) How do I find out more about EFT and related treatments? There are hundreds of websites on EFT/ Meridian Tapping. I recommend reviewing: EFT Masters Worldwide, Tapping International, and the movie The Tapping Solution.